The Mercedes-AMG GLC 63 4MATIC+ Coupé is at the starting gate. Its temperament cannot be overlooked. This car is made for speed. Just like you. When do dynamics begin? When the sight of muscular shoulders and powerful lines increases your pulse rate. The exterior of the Mercedes-AMG GLC 63 4MATIC+ Coupé stands out with expressive aesthetics. The striking rear lights and AMG rear apron with diffuser add to its expression of power. The AMG sports exhaust system provides another visual accent at the rear with two chrome-plated twin tailpipe trim elements. The powerful sound of the V8 engine rounds off the impressive presence of the SUV Coupé perfectly. Dynamic design features define the exclusive character of the Mercedes-AMG exterior. The completely distinctive AMG front end with a more pronounced V-shape includes the AMG front apron in a jet-wing design and the AMG radiator grille with vertical, black louvres and trim strip in high-gloss chrome as well as "AMG" lettering. The AMG radiator grille and AMG front apron with air intakes devoid of grilles render the sophisticated cooling system lurking behind visible. The side design boasts 48.3 cm (19-inch) AMG 10-spoke light-alloy wheels, painted in titanium grey and with a high-sheen finish, wings with characteristic AMG cladding and also "V8 BITURBO 4MATIC+" lettering and AMG-specific side skirts. The crowning glory is the imposing rear end with AMG spoiler lip, rear apron with diffuser fins and AMG sports exhaust system with two chrome-plated twin tailpipe trim elements. As standard, the GLC 63 4MATIC+ is equipped with 48,3 cm (19-inch) 10-spoke light-alloy wheels painted in titanium grey and with a high-sheen finish featuring tires of size 235/55 R 19 (front) and 255/50 R 19 (rear). Optionally, 50.8 cm (20-inch) 5-twin-spoke light-alloy wheels, painted in titanium grey and with a high-sheen finish or painted in matte black and with a high-sheen finish are available. In addition, 53.3 cm (21-inch) 5-twin-spoke light-alloy wheels as well as 53.3 cm (21-inch) cross-spoke forged wheels can be selected. For both variants, the driver can choose between two different paint options: matte black with high-sheen rim flange or titanium grey and with a high-sheen finish. The AMG high-performance braking system with large, all-round internally ventilated and perforated brake discs provides excellent deceleration figures and fade resistance. From typical AMG to restrained, the sound of the AMG sports exhaust system adapts to the currently selected transmission mode by means of a variably adjustable exhaust flap. An attractive look is ensured by two chrome-plated twin tailpipe trim elements. The electric exhaust flap is infinitely variably controlled across the entire engine speed range by means of maps stored in the transmission mode. This provides a homogeneous level across the entire engine speed and low ranges. A blip on the throttle (in driving mode S) and a misfire (in driving modes S+) emphasize the sporty characteristics of the particular transmission modes. Three variably adjustable exhaust gas flaps are used to adapt the sound to the selected drive program. The driver can also change the sound characteristics at the press of a button. This allows a maximum spread of the sound, from comfortable to highly emotive. Upon request, the Mercedes-AMG GLC 63 4MATIC+ can be equipped with the AMG Night Package. With striking design elements in black, the AMG Exterior Night Package underscores the sporty, expressive character of the vehicle. Furthermore, the AMG Exterior Carbon Fiber Package II is available. With sporty details made of carbon fiber, it creates some highly effective contrasts and gives the vehicle an even more dynamic appearance. Inspired by motorsport: the interior of the Mercedes-AMG GLC 63 4MATIC+ Coupé. The AMG sports seats provide optimal lateral stability in banking. The optional AMG performance seats guarantee more comfort, even on the racetrack. At the same time, the AMG performance steering wheel in nappa leather ensures optimal grip. The sporty high-quality interior comprises, as standard equipment, such appointments as sports seats with optimized lateral support and AMG badge in the seat backrests, three-spoke AMG Performance steering wheel in nappa leather with flattened bottom section as well as an AMG instrument cluster with AMG main menu including RACETIMER and AMG start-up display. Individual flair is added by fine aluminum trim elements and the AMG brushed stainless-steel sports pedals with rubber studs. Dashboard, beltlines, armrests and door center panels are finished in ARTICO man-made leather. The high-quality upholstery in ARTICO man-made leather/DINAMICA microfiber in black features an AMG-specific seat upholstery layout. AMG door sill panels (front) and a black roof liner round off the high-quality overall impression. As a standard, the AMG GLC 63 is equipped with sports seats featuring an upholstery in ARTICO man-made leather/DINAMICA microfiber in black. They offer optimized lateral support, an AMG-specific seat upholstery layout and AMG badges in the front seat backrests. For outstanding vehicle control, the AMG Performance steering wheel in nappa leather features a flattened bottom section as well as perforated grip areas. The sporty design is completed by silver-colored aluminum shift paddles and a 12-o'clock marking. Optional extra: the AMG Performance steering wheel in nappa leather/DINAMICA microfiber. For even better grip during sporty maneuvers, the grip area of this variant is finished in DINAMICA microfiber. The AMG instrument cluster offers an exciting AMG design and valuable information for sporty drivers. Exclusivity and sportiness are visually underscored by the two-tube look of the round dials with carbon fiber-look backplates and a surround in silver chrome. The speedometer with a 320 km/h dial is on the left, the tachometer with the AMG logo on the right. The AMG main menu including RACETIMER and the AMG start-up screen are shown in high resolution and in color on the central 13.97 cm TFT multifunction display. With the RACETIMER it is possible to measure and store lap times. The individual transmission modes are displayed in an AMG-specific way. Optimal performance – that is our aim. It’s in our genes. We develop drive technologies that leverage their technical superiority in every driving situation for this purpose. Just like the high-performance V8 bi-turbo engine in the Mercedes-AMG GLC 63 4MATIC+. A full 350 kW (476 hp) of power and 700 Nm of torque are available for uncompromising acceleration. The speedometer is at 100 km/h after only 4.0 seconds. AMG 4.0-Liter V8 Biturbo Engine. AMG SPEEDSHIFT MCT 9-Gear Sports Transmission. The 4.0-liter eight-cylinder biturbo engine is already being used in numerous AMG Performance vehicles. It is also installed in the AMG GT sports car with dry sump lubrication. A characteristic feature is that the two turbochargers are not positioned on the outside of the cylinder banks, but inside the cylinder "V." The main advantages of this design are the compact engine construction, optimal response and low exhaust gas emissions. Powering the Mercedes-AMG GLC 63 4MATIC+, it puts out 350 kW (476 hp) with a maximum torque of 650 Nm. Acceleration from zero to 100 km/h is completed in 4.0 seconds. The top speed is 250 km/h (electronically limited), 270 km/h respectively (with the optional AMG Driver’s Package). With nine gears as well as RACE START and double-clutching functions, this transmission allows extremely dynamic acceleration and ultra-short shift times as well as a fuel-saving driving style. The systematic further development of hardware and software has made it possible to further optimize the reaction times. This means that the driver's shift commands can be carried out faster than ever before. Gear shift operations are executed with no interruption in tractive power. Ultra-fast, responsive multiple downshifts are another forte of the AMG SPEEDSHIFT MCT 9-gear sports transmission. The driver can change via kick-down directly from 9th into 5th or from 6th into 2nd gear, for example. The RACE START function supports optimal acceleration from a standstill like it would be from the starting line in motorsport events. The performance-oriented all-wheel drive with fully variable torque distribution combines optimum traction, hallmark AMG driving dynamics and the ultimate in driving enjoyment. It improves handling safety and road-holding on wet or wintry road surfaces. Thanks to the fully variable torque distribution, the driver benefits from the advantages of all-wheel drive and rear-wheel drive in equal measure. An electronically controlled clutch provides for variable connection of the permanently driven rear axle with the front axle. The ideal torque distribution is calculated continuously, according to the given driving situation and the driver's wishes. This enables a seamless transition from traction-oriented all-wheel drive to 100% rear-wheel drive. In addition to traction and transverse dynamics, the all-wheel drive also improves the longitudinal dynamics of the vehicle for even more dynamic acceleration. AMG Sports Suspension Based on AIR BODY CONTROL. The multi-chamber air suspension system, in combination with an AMG-specific spring/damper setup, which is even sportier compared with the 43-series models, and the continuously adjustable damping system ADS+, ensures vehicle dynamics and ride comfort at a very high level. The damping at each wheel is adapted to the current driving situation and road surface conditions. This is done rapidly and precisely using separate valves for the compression and rebound of the dampers. A harder spring rate, for example when cornering and braking, effectively reduces rolling movements. With the "Comfort," "Sport" and "Sport+" settings, the multi-chamber air suspension can be set from comfortable to suitable for racetrack use, whereby a wide range is available between comfort and sport and noticeably changes the handling. Thanks to the pneumatic all-round self-leveling suspension, the vehicle maintains a constant level irrespective of the load, and can be raised to increase the ground clearance. At high speeds, the suspension is automatically lowered, helping to reduce aerodynamic drag and further improve handling stability. Independent multilink rear suspension with harsher tuning compared with the 43-series models ensures more precise and more neutral wheel control. Secure traction at high speeds is guaranteed by a mechanical locking differential on the rear axle. In conjunction with the S-Model, an electronic locking differential is used that ensures improved traction and directional stability thanks to on-demand control of the locking ratio. AMG Mechanical Rear-Axle Limited-Slip Differential. 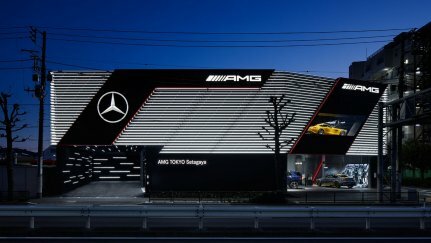 The mechanically controlled AMG rear-axle limited-slip differential provides improved traction in every driving situation, especially when the driver adopts a sporty driving style. This is done by reducing the slip on the inside driven wheel. In contrast to a conventional differential, the AMG rear-axle limited-slip differential uses multi-disc clutches and two thrust rings. When drive torque is applied to the rear axle, the thrust rings operate the multi-disc clutch to suit the requirements. The coupling redistributes the drive torque to the wheel with the better traction; spinning of the inside wheel is prevented. The Mercedes-AMG GLC 63 S.